Hurricane season begins early and rumbles all summer long, well into September. 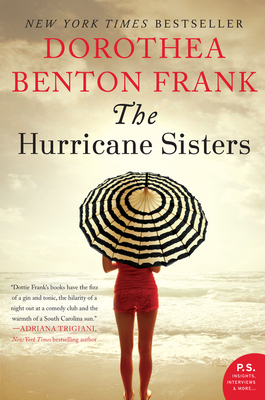 Often people's lives reflect the weather and The Hurricane Sisters is just such a story. Once again New York Times bestselling author Dorothea Benton Frank takes us deep into the heart of her magical South Carolina Lowcountry on a tumultuous journey filled with longings, disappointments, and, finally, a road toward happiness that is hard earned. There we meet three generations of women buried in secrets. The determined matriarch, Maisie Pringle, at eighty, is a force to be reckoned with because she will have the final word on everything, especially when she's dead wrong. Her daughter, Liz, is caught up in the classic maelstrom of being middle-age and in an emotionally demanding career that will eventually open all their eyes to a terrible truth. And Liz's beautiful twenty-something daughter, Ashley, whose dreamy ambitions of her unlikely future keeps them all at odds. Luckily for Ashley, her wonderful older brother, Ivy, is her fierce champion but he can only do so much from San Francisco where he resides with his partner. And Mary Beth, her dearest friend, tries to have her back but even she can't talk headstrong Ashley out of a relationship with an ambitious politician who seems slightly too old for her. So where is Clayton, Liz's husband? He seems more distracted than usual. Ashley desperately needs her father's love and attention but what kind of a parent can he be to Ashley with one foot in Manhattan and the other one planted in indiscretion? And Liz, who's an expert in the field of troubled domestic life, refuses to acknowledge Ashley's precarious situation. Who's in charge of this family? The wake-up call is about to arrive.